Will 'Waige' Shippers Finally Get Their Wish on This Season of 'Scorpion'? 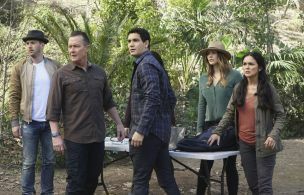 It took being stranded in the ocean, but Scorpion's Walter (Elyes Gabel) and Paige (Katharine McPhee) finally talked out some of their lingering tension. Although the duo was open with each other—and Walter risked his life to make sure she would safely survive the sharks that were circling them in the water—they're not ready to take the next step in their relationship…yet. "I think people have been very patient with the Waige thing, and I get excited for where it's going to go, as well," McPhee says. "By the end of this season, something has to happen, right? We don't really know, exactly—I think we've gotten little hints from the writers—but I think we all individually do love the interpersonal relationships." McPhee speculates whenever the duo does get together, it'll be "a moment of complete weakness of their attraction to each other. Take the logic out of it, take the heart out of it." Adds Gabel: "When we are our most true, we do end up giving the other person what they need." More immediately, the team has to save the day at an international chess tournament in Monday's episode…and Walter and Sylvester (Ari Stidham) get into their own match. "Walter and Sylvester have a really hilarious competitive thing going with who is a better chess player," Eddie Kaye Thomas (Toby) says. "Just like Scorpion: it's a really good opportunity for good comedy in the middle of this save the world stuff." And the competition bled over off-screen: Stidham and Gabel started their own game—but the actors are still debating who was winning their match. "I was winning," Stidham says. "No you weren't!" Gabel laughs. "You are a liar! I was not going to put him in s--t, but first of all, I beat two other people—this is where I become Walter—I didn't lose to anyone else…Ari had a lot of pieces on the table and not a lot on the chess board." "I was winning, and the history books will show me as the winner," Stidham retorts.